Shauna and I often use a meal plan to figure out what it is we're going to eat during the week. It helps us grocery shop a bit smarter and saves us the "what're we gonna have for dinner" discussion. Tonight's meal was supposed to be salad and/or pasta. (I say and/or because I wanted pasta and she wanted salad.) Well, Shauna got her salad fix at lunch thanks to a co-worker, so that left us with doing pasta. Normally, we just do a meat sauce and call it good. I, however, was a bit meat-sauced out. (I like meat sauce, but I needed some variety.) Now when you have spaghetti, what are you supposed to put on top of it? Meatballs of course. This is really easy. Combine all of the ingredients in a bowl, form into little balls (golf-ball sized works well) and then brown them in a skillet in the olive oil on all sides for about 10-15 minutes depending on size. Even the ones I cooked the tar out of were still juicy on the inside, and you have to make sure you get the crispy outside. So good! I like-ah the meatball subs. So yummy. Ooooh… I wish I could get someone ELSE to cook these FOR me. Yeah! If we made these again, I probably would try to spice them up a little. They were good, but I expected more garlicky, spicy goodness. I’d add more garlic and probably some dried onion flakes to add more flavor. When I want meatballs, I buy a box of them from the grocery store. You guys work too hard. Boxed meatballs? What, do you rehydrate them or something? Sick. Of course, you’ll have your very own Ikea soon. And you can bring home your very own frozen meatballs. 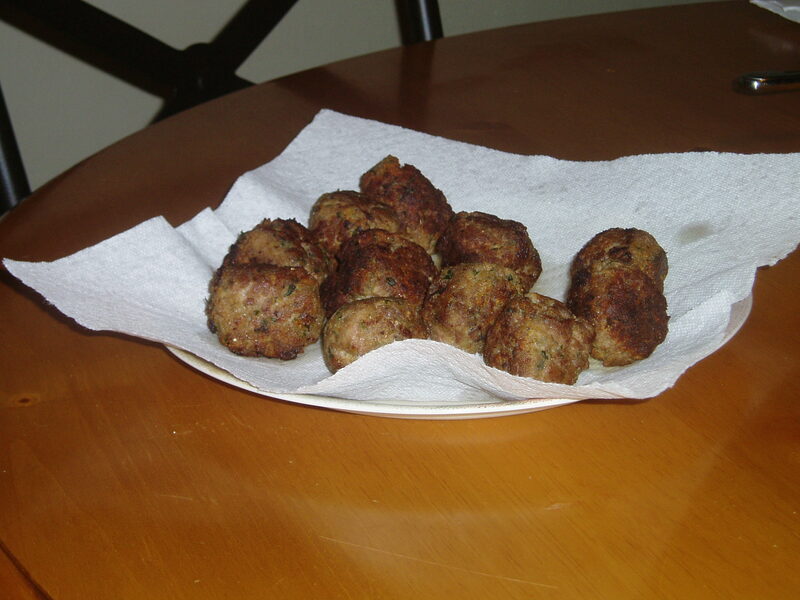 Of course, these meatballs probably won’t help with the garlic deficiency, being completely non-Italian. Sigh. Ahh, thank you so much for this, very interesting. I’ve been searching all over for a certain pasta dish that my wife and I had on our very first date in a littel Italian on the corner that has now sadly closed down. I found a big website dedicated to just pasta recipe ideas (you might be interested in that site for ideas) but no luck yet in finding the one! Damnit… I’m fairly certain it had muscles in it.. Any ideas? Thanks so much, I’ve never actually had turkey meatballs! This sounds so delcious, I’m going to make them once I get my hands on some ground turkey. Next story Who Won the Race for White City Community Council?